Bricks 4 Kidz » Eat your science! You don’t have to make everything you do with your kids an educational experience. 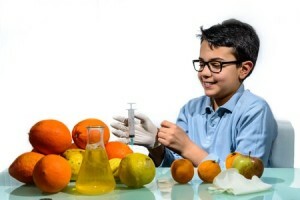 But since science is fun, why not use everyday activities to bring science to life for your kids? And you’ll help them see that science is all around them. Where to begin? Food is an easy – and yummy – starting point! It’s time to eat your science! Juice. You can always start by letting your kids make their own juice. They can try any combination they think would be tasty. Then just add a little more fun (and ice) to make a juice slush – without a blender! Or try this layered juice drink. What makes the layers stay in place? Density. Gelatin. Teach your kids about amber by making amber fossils. This one might take a little more supervision from Mom and Dad, but only because of the hot water needed to dissolve the gelatin. Weeds. Of course you don’t want to send the kids out into the yard to graze, but you can send them out to hunt for edible plants (besides those growing in the garden). Dandelions and clover are only two of the edible “weeds” you can find. Head out for a nature walk and see what food you can bring home. Butter. No need to buy butter. Let your kids make it. This is one of the easiest experiments. You just need heavy cream, a jar with a lid and a marble. Put the cream and marble in the jar. Put on the lid. And shake, shake, shake. Have fun experimenting with food. Another perk: If you have picky eaters, you can have them eat their science (and they might just forget that they are eating their veggies too! ).